As I child I had several passions but since Linda Carter got the Wonder Woman job and all the Charlie’s Angel positions were filled I was in quite a dither to select another passion! I was lucky, I had many dreams as a child and at one point or another I am pretty sure I wanted to pursue every career possible. Regardless of what the dream was, there was one consistent, overarching theme and that was to be the best at whatever it was I choose to do. I am lucky to have found two passions in life, education and music. I am currently pursuing my PhD in instructional design for online learning and hope to complete it before pigs can really fly. I may never get a chance to “officially” wear the Wonder Woman uniform or talk to Charlie over the intercom but I get to do something better. I get to make music and everyday I get a chance to truly help people. This is my sophomore album and while it can’t make you fly it can get you singing and tapping your foot or outright dancing in public! Close the Door was recorded in Nashville and is filled with up tempo and poignant songs that everyone can relate to. I truly hope you enjoy the selections as much as I enjoyed recording them. "Close the Door" Reviewed by RadioIndy.com! “Close the Door” is the upbeat sophomore effort from contemporary pop country artist Tracylyn. Tracylyn gives a powerful vocal performance with a country twang similar to vocalists such as Faith Hill and Martina McBride. Her backing band is sound and creates solid arrangements that incorporate the violin, piano, and steel guitar into nearly every track complimenting Tracylyn’s vocals quite well. The songs are generally up-tempo and are about love, faith and small town life. The lyrics are memorable and the songs are all extremely catchy. The recording quality is very good with a polished vocal sound and clarity of each individual instrument. “Maybe I Made You Up” is a psychological song about falling in love, with a nice melody, a catchy chorus and some nice guitar work. 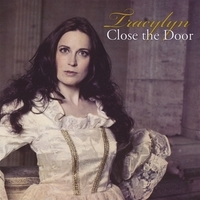 The title track, “Close the Door” is the sole downtempo track on the album, a slow piano ballad with powerful lyrics about a former significant other’s “infidelity.” Overall, “Close the Door” is a fun album with an impressive vocal performance from Tracylyn, true-to-life lyrics, and great arrangements. Fans of female vocalists and contemporary pop country won't “Close the Door” on Tracylyn.